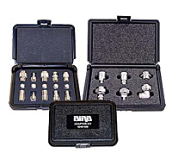 Bird precision adapter kits offer precision performance for your RF requirements. Adapter options include N, UHF, BNC. TNC and 7/16 DIN.